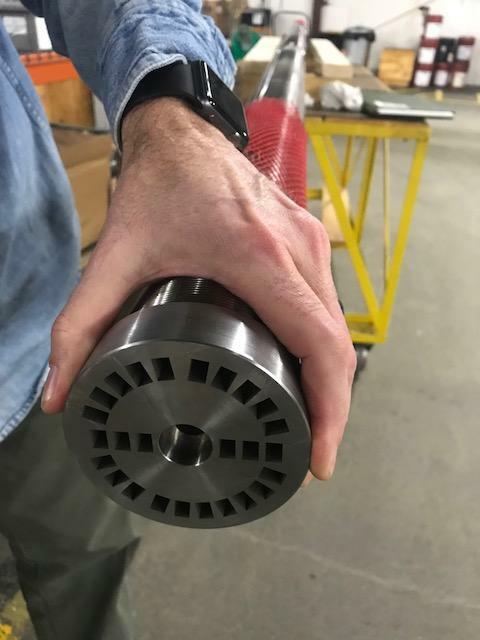 Greg Mancini, QA/QC Manager, explains, "We needed a reliable method of marking the end of a 14 foot long, K-Monel shaft that is also very expensive. We could not afford to make any mistakes with the marking since the material is very hard and very precisely machined." 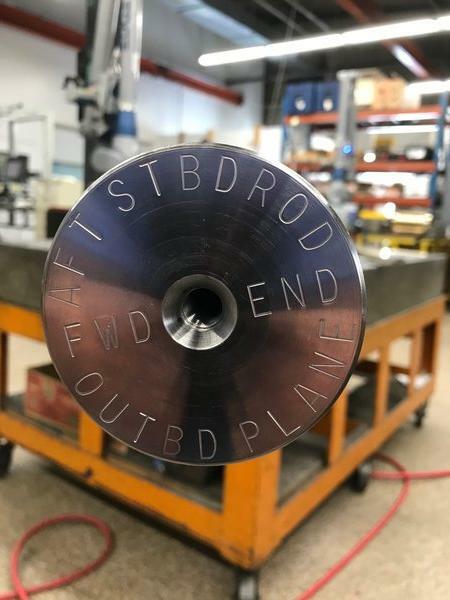 The marking needed to meet a government specification calling for the lettering to be permanently marked and uniformly applied with a consistent depth using a rounded, low stress steel hand stamp. After a telephone consultation and follow up visit with Chris Podles from Durable, together they came up with the idea of a fixture that would screw into the existing threaded hole on the end of the drive shaft. This fixture positions each custom steel hand stamp exactly in the right place every time. Mr. Mancini marked the fixture slots with the letter and symbol so they would not make any mistakes. "Using a three-pound sledge hammer and the Durable Technologies steel hand stamps, we were able to make a very clean and crisp mark every time," says Mr. Mancini. Mr. Mancini continues, "Durable and Chris really came through for us. They understand materials, applications, and how to create a custom solution for low volume, high value parts like ours. They really responded quickly and helped us develop a unique solution that really did the job." Durable Technologies has a steel hand stamp for your specific part marking requirement, even if it is a custom job. 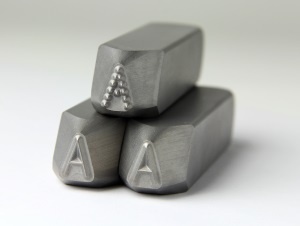 We manufacture, according to your specifications, heavy duty steel hand stamps that provide extra long service life. Simple or complex, text or logos, all designs can be made to order, including trademarks and maker's marks. Ranging in size from tiny steel hand stamps to mark jewelry to large steel hand stamps to mark steel slabs - we can meet your needs. Characters can be sharp face, low stress full (round) character, low stress dot character, or customized to your specific marking requirements. Click here for more information on our line of Steel Hand Stamps. You can also contact us now to speak with someone that understands your application. This post was published on April 17, 2018 and updated on April 17, 2018.